So this afternoon (yesterday, really) I got a voice mail that I had been somewhat expecting for the last few weeks. Back when I first found out that I would not be a candidate for job in my current department I applied at a school near Renae's job. I found the opening on the school's webpage. A week after submitting my application materials, I called their HR department to find out if they had received a complete application package. (They had.) So, I waited to hear whether I would get a call from their search committee. After not hearing from them after 6 weeks, I called and asked about the status of the search. The HR rep called me back and said that they had re-evaluated their needs for next year and would probably not be hiring anyone. Today's voice mail confirmed that the decision had been finalized. 1. I should be applying to more places. 2. I'm not entitled to an interview from ANY place to which I apply. IF YOU ARE NOT GOING TO HAVE A SEARCH, YOU SHOULD NOT PLACE AN AD ON YOUR WEBSITE. What happens when I send a picture to flickr as a twitter? 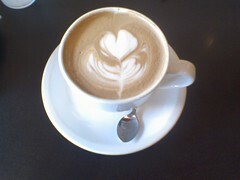 At the Coffeehound for a round of grading. R. killed tonight. 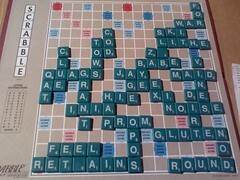 She had three 's' tiles, the 'j', 'x' and 'q' tiles. 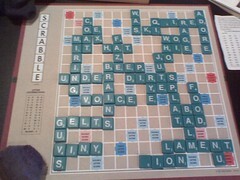 She got the only bingo of the game: retrains. (But, she needed a little help on it.) 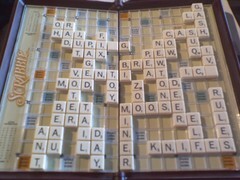 I had one good play: za for 61 points. Do you subscribe to Ubuntu Forums about some hacks for getting the streaming audio and video to work, but yesterday someone posted that the streaming was now working with no strange workarounds needed. I installed the MediaPlayerConnectivity Firefox Add-ons in my browser of choice, which is currently Flock I logged onto MLB.com and chose the Cubs/Rockies game and seconds later was listening to the sweet play-by-play of Pat and Ron. This May our department is offering two sections of the "Sound, Music, and Hearing" class, which fill a general education requirement for Physical Science Labs for non-science majors. It's a fun class to teach because we get to play with a lot of fun toys and do a lot of neat experiments that we don't often have time to cover in the general physics labs. The professor teaching the other section and I decided that we wanted some new resonance tubes with the water reservoir attached to a stand for looking at standing waves in a closed-open tube. The CENCO (or is it Sargent-Welch?) catalog had the best deals, but they also had the largest variety of resonance tube experiments to order. Our budget is only a few thousand dollars, and as much as we'd like to have 4 resonance tubes for the class, we decided to order one of the low cost models (the Student Resonance Apparatus) and one of the mid-range models (the CENCO Resonance Apparatus). I placed the order a week ago and recently some boxes appeared in the main office. 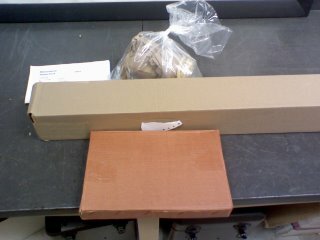 I opened the box and removed all the packing material. The kit was nicely packaged. All the clamps and the reservoir and rubber tube was all in a ziplock bag. 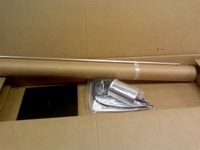 The aluminum rod was taped to the cardboard tube which contained the acrylic tube. 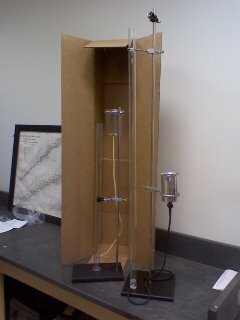 I pulled the instructions out of the bag and worked on assembling the apparatus. Assembly was straightforward. The rod screws into the base, then the clamps are attached and the tube is slid into place. My only complaints were that the rod was not perpendicular to the base (it must have been tapped a little crookedly) and that the instructions kept referring to the "tripod". I don't know about you, but when I see the word "tripod," I instinctively think of something with three legs and not a flat base. 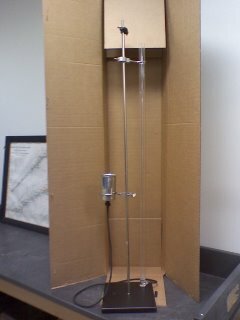 Here's a photo of the assembled resonance apparatus. The tube is quite long, meaning we should be able to get lots of standing waves in the tube for a large variety of tuning forks. I cheated a little bit with the photo by choosing an angle that does not draw attention to the lean of the rod. One of the features that was kind of nice about this apparatus is that the bottom of the tube has a peg which fits into a small hole in the base to keep the tube well positioned. 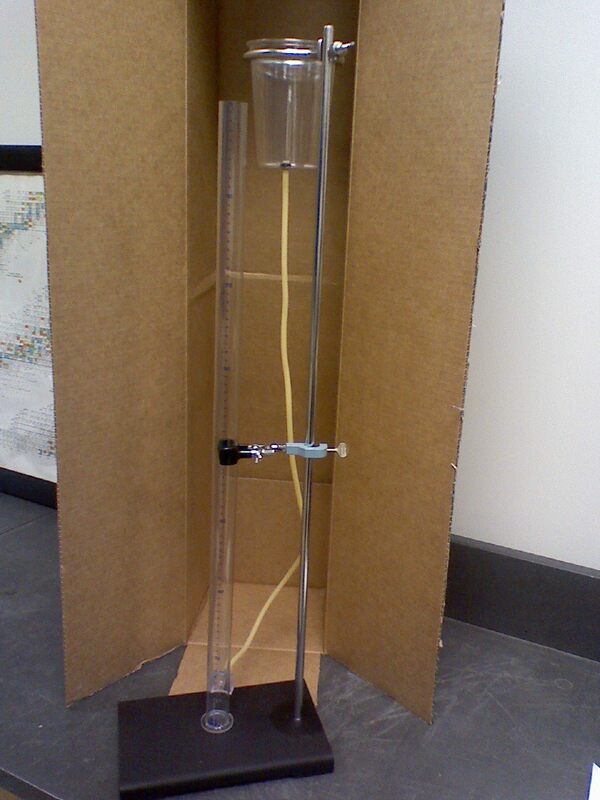 Also, this apparatus includes a clamp for holding a tuning fork above the resonance tube. The clamp is just a right angle clamp, which was a little disappointing that it wasn't anything more specialized, but it will be interesting to see if the clamp works well to hold the tuning fork while the fork is vibrating. After setting up the mid-range model, I unpacked the economy model. The contents of the shipping box are shown in the following photo. After I made it through all of the layers of packaging, assembly of the economy model was as easy as the mid-range model. 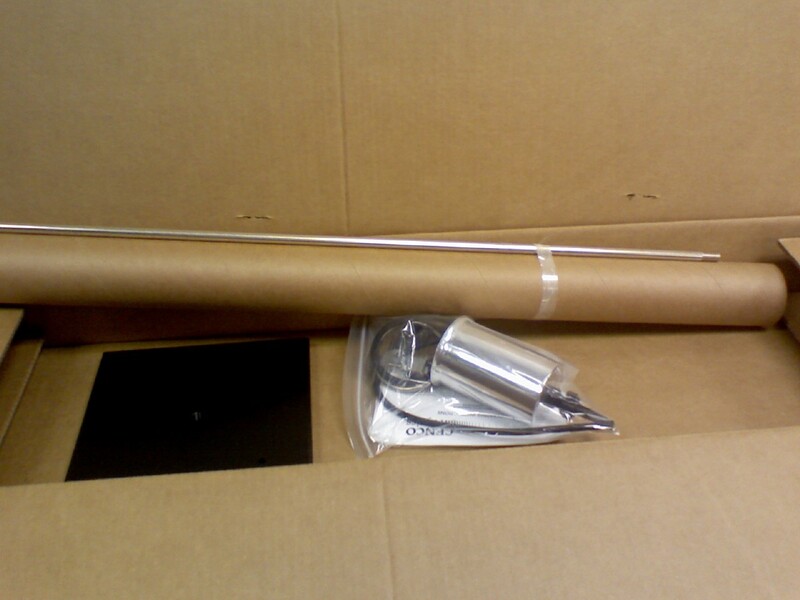 The tube is held to the rod by a test tube clamp and there is no clamp for the tuning fork. The economy model uses what is essentially a large plastic cup (complete with the SOLO logo on the bottom) for the water reservoir. One wonders how much abuse the reservoir will be able to stand. I suppose that if it is damaged, replacement would not be too difficult or costly. The economy model does not have a peg on the bottom to help keep the tube in place on the base. like the mid-range model does. Also, the economy model is significantly (~50%) shorter. You can easily see the difference in the height of the two. Also, the lean of the longer tube is more apparent when comparing the two. The real question is how do the two compare in terms of using them to do experiments. I haven't had a chance to try them out yet, but I have made some observations from putting them together. The real question is: What do you get by spending the extra $200 to go from the economy model to the mid-range model? Longer tube, meaning a wider range of frequencies to work with. Shorter tube means experiments could potentially be done on the lab table, instead of on floor. Less expensive components means lower costs for maintenance. The smaller size may be easier to store. I'm going to have some fun playing around with both models in the next few days as we continue to get ready for May Term. In my Saturday morning browsing, I stumbled onto a great summary of why Twitter is actually useful and worth signing up for. I've been twittering for a week now, and I have to admit that I quickly got addicted to it. I doubt that I will be getting or sending twitters that drag me into a bar for drinks anytime in the near future, but there may be other situations where I make connections with people I would otherwise have missed. 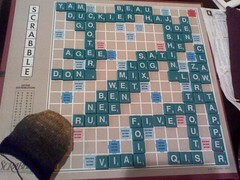 We each got a bingo tonight. 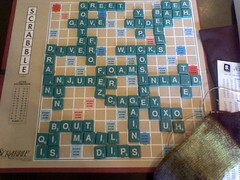 I had 'joshing' and R. had 'duckier'. To play video messages sent to email, QuickTime 6.5 or higher is required. Visit www.apple.com/quicktime/download to download the free player or upgrade your existing QuickTime Player. Note: During the download process when asked to choose an installation type (Minimum, Recommended or Custom), select Minimum for faster download.